London Underground and union leaders have begun talks in an attempt to avert a 48-hour Tube strike which could leave millions of travellers stranded. Members of the Rail, Maritime and Transport (RMT) union plan to walk out from 1859 BST on Tuesday in a dispute over pay and proposed job cuts. On Friday LU offered staff a four-year pay deal or a two-year deal which promised an "above inflation pay rise". The RMT wants a 5% pay hike and a promise of no compulsory redundancies. LU made an improved offer of a four-year deal of 1.5% this year and then the inflation rate plus 0.5%; or a two-year deal of 1% now and inflation plus 0.5% in year two. The RMT has accused LU of refusing to abide by an agreement which ensured job security and ruled out compulsory redundancies which would put 3,000 jobs at risk. The RMT's strike is also in opposition to TfL's planned £2.4bn efficiency savings package across the whole network - buses, trams and Docklands Light Railways as well as the Tube - which the union warned could lead to compulsory redundancies. LU interim managing director Richard Parry said the new offer was "very fair". "While we recommend the four-year offer, both provide an above-inflation pay increase and stability for our staff in a tough economic climate." He called on the RMT to engage in "constructive talks". The RMT had said it would consider its position before the talks resumed. 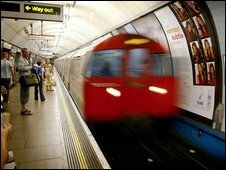 John Morgan-Evans, an official with the Unite union which has also joined the pay row, said: "We have formally informed London Underground that we are in a dispute and want to see a substantially better offer if action is to be averted."